Daniel Carruthers with tips for photography while cycling [Part I and Part II]. The Battle of the Fisherman’s Wharf covers Taiwan’s involvement in the Pacific War. FotoZon takes a ferry to Little Liu Chiu Island. Mark Forman with pics from the Intangible Cultural Heritage exhibition at the Taichung Creative Culture Park. Stu visits a wild hot spring in Xinxing. Michael C. rides a NeverStop Challenge. David attends a freestyle motocross event at Freedom Square. A Hungry Girl strongly recommends Mogoo Popcorn. Wandering Taiwan visits the Mystery Coast and Jinbaoli Old Street. DONATE: Help victims of the recent earthquake in Haiti. 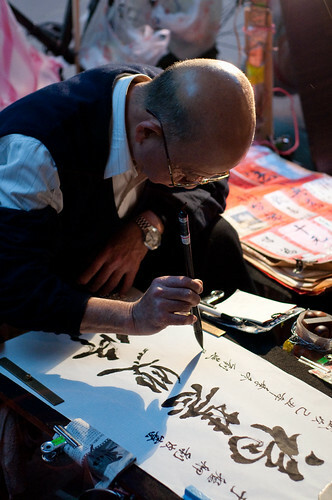 I like these two calligraphy pictures you took, and beautiful writing he did! Thanks, I’m very happy with how they turned out. I’m not really good at people photography, but my New Year’s resolution is to improve this year.